Media captionFor more than 40 years Cyprus has been a divided island. UN Secretary General Antonio Guterres says a deal on reunifying Cyprus is "very close", but cautioned against hopes of a "quick fix". Speaking after the first round of peace talks in Geneva, he said a settlement was within reach if the "instruments" were there to implement it. The Greek- and Turkish-Cypriot communities have been split since 1974 and are divided by a UN buffer zone. Both sides have exchanged maps setting out proposals for new boundaries. It was the first time they had done so, according to the UN, and was hailed as an important advance towards a deal. "We are coming very close to what is the settlement," said Mr Guterres, flanked by the Greek- and Turkish-Cypriot leaders - Nicos Anastasiades and Mustafa Akinci. "You cannot expect miracles and immediate solutions. We are not looking for a quick fix." Can Cypriots heal their divided island? Key stumbling blocks include the return of property to tens of thousands of Cypriots who fled their homes in 1974, and the question of whether any Turkish troops will remain in northern Cyprus after reunification. Turkey still has 30,000 troops stationed in the island's north. The foreign ministers of Greece, Turkey and the UK - which act as Cyprus's security guarantors - are involved in the negotiations, as are EU foreign policy chief Federica Mogherini and European Commission President Jean-Claude Juncker. The talks are expected to last into the weekend. Any deal would have to win the support of both Cypriot communities in separate referendums. The goal is for the two sides to share power in a two-state federation and the UN says it is the best chance to reunify the island. The BBC's Imogen Foulkes in Geneva says the violent partition of Cyprus in 1974 has left deep scars and even deeper suspicions. Media captionCould there be an end to decades of division? Property: What should happen to the properties that Greek Cypriots had to abandon in 1974? Should they get the right to take their old homes back, or be compensated - and if so by how much? Security: How can the security of the Turkish Cypriots be guaranteed if Turkey's estimated 30,000 troops leave? Greek Cypriots see them as an occupying force, so should some stay or should Turkey retain the right to intervene? Who would act as a guarantor of the deal? The EU, of which Cyprus is already a member, or the UK, which has two military bases on the island? Power and the role of the EU: There is talk of a rotating presidency, but how would that work? And could a Turkish Cypriot president really represent the country from time-to-time at EU summits? Territory: How much more territory should Greek Cypriots gain to reflect the fact that they make up the majority of the island's population? 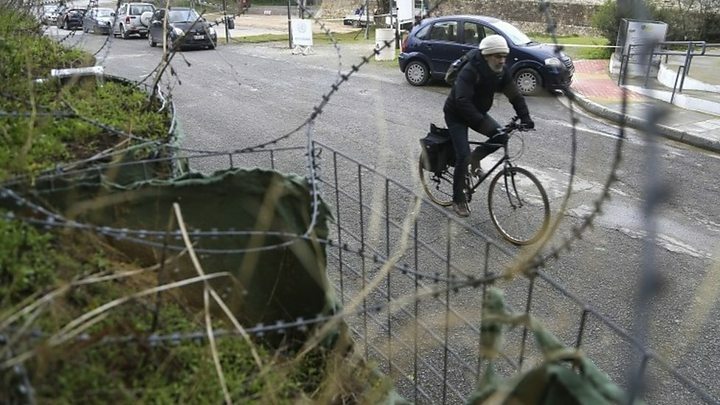 UN peacekeeping forces estimate that 165,000 Greek Cypriots fled or were expelled from the north, and 45,000 Turkish Cypriots from the south, although the parties to the conflict say the figures are higher. 2004 - Cyprus, still divided, joins the EU, after a UN peace plan was backed by Turkish Cypriots but rejected by Greek Cypriots. Video Cyprus talks: Could there be an end to decades of division?